Let's be clear that I'm crushing on the entire Lonny issue. But this picture sent my heart racing into perfect Christmas territory. I adore the color scheme, the tree, the ribbon, that chair. Everything is beautiful. Even the radiator looks chic. Designed by Eileen Kathryn Boyd. We have a packed weekend with holiday soirees! I'm very excited to spend time with lots of friends, co-workers and family to toast the holiday. Have a great weekend, grab those last minute gifts, and see you Monday! I love radiators...I'm sure you weren't expecting that, but there is something about them that I just adore. I have a 75 year old home and the guy who had it before me gutted it and removed all of the awesome radiators and I get so sad when I think about it! Take care! Even though I'm a little late, I love your Christmas tree and mantle! Just lovely! 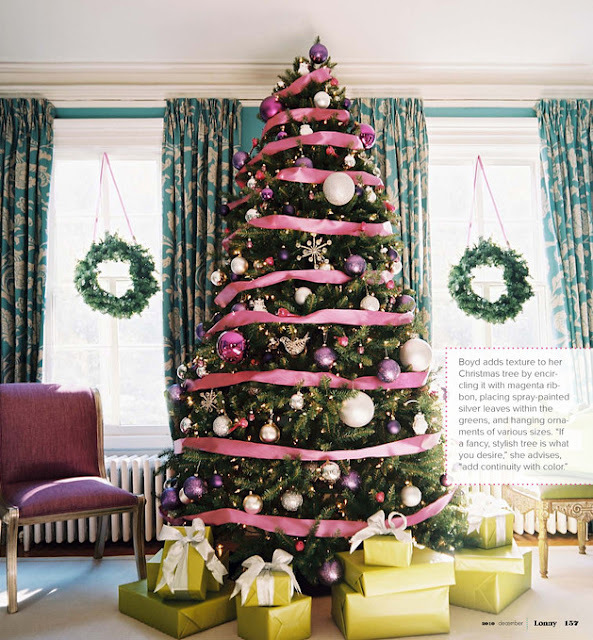 And that WHOLE issue of Lonny was a dream - I love color and use lots of it in my house - and that issue was over the top!